Saturday night at the Park Theater, Las Vegas, Rob “Bravo” Brant (24-1-0 16KOs), pulled off a major upset over hot middleweight prospect Ryota Murata (14-2-0 11KOs). Not many gave Brant much of a chance against the hard punching, former 2012 Olympic Gold medalist. One person who did was Timothy “Desert Storm” Bradley. Tim felt Brant had the speed, power and boxing skills necessary to give the Japanese star a good fight. However, during the early and middle rounds, Tim felt Rob was a making a bad move by going to his left. Tim explained Rob was moving into the path of Murata’s big right hand, one he used to score eleven kayos. Makes sense, doesn’t it? You want to move away from danger. But, that strategy means you might have to sacrifice a strength of your own. Brant obviously felt his own speed, powerful right hand and skill would be enough to give him the edge. In the post fight interviews, Murata acknowledged that Brant seemed to know…. When I was going to throw the right hand. Murata could have added that his attempts to throw it were met with a barrage of punches from Brant. Rob set the tone right from the opening bell. Instead of running from the hard punching Japanese super star, Rob went on the attack. Initially, Murata smiled in acknowledgment of Brant’s efforts, trying to give the impression he was confident in his ability, and he would catch up to his foe. There were many times, over the course of the twelve round fight, when it appeared Murata was about to turn the tide. Often, he tried to use rough house tactics like a “stiff arm” to Rob’s head to block his vision and position his head just right for the follow up right hand. When Rob’s vision was momentarily blocked, he didn’t panic. He used his other senses, and would come over Murata’s stiff arm, with a right of his own. Rob used multiple jabs as both an offensive and defensive weapon. The left in Murata’s face proved more effective than Murata’s right. Soon Murata’s smile disappeared and was replaced with a new image, a red and lumpy one. This young man from St. Paul, MN, tirelessly threw over 1200 punches! Rob’s plan was the right way. He wasn’t going to start in a timid fashion, one that would allow Murata to get comfortable, and start firing right hand bombs. Instead Rob used his speed and power to set the tone. In the middle rounds, Murata came close to breaking Rob’s rhythm, but Rob stayed strong and demonstrated he has a good chin. Soon, Rob regained control, and continued primarily moving to his left, sticking Murata with hard jabs. Every time Murata would land a right, Rob would answer back with a multi-punch combination. More and more Murata’s face showed damage. 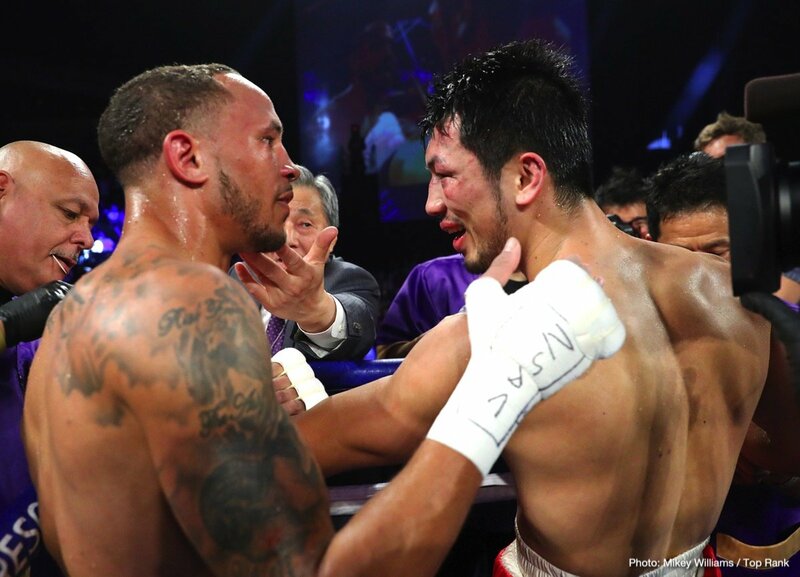 In between rounds, his cornermen furiously applied eye iron both above and below his eyes..
Murata was no longer smiling. Rob was, and Rob’s smile wasn’t one of disguise. His was one of realization. He obviously was feeling victory coming his way. His second wind was flooding in. Everything was coming together. His bounce and shifting weight were in sync, allowing him to rip off straight punishing lefts and rights, with an occasional uppercut, which landed when the fatigued upper body of Murata started to lean in. Rob’s adrenaline was flowing through him, giving him that extra power and strength he needed to remove any remaining doubt the judges might have. The fight was great. It was one of action, danger and skill, and that oh so important heart. Rob has plenty of that to go along with his skill. He demonstrated to Bradley that even when he moved left, it was the right thing to do. Congratulations to Rob “Bravo” Brant. You’re the Champ.